The University of West Georgia (UWG) and Southwire teamed up in 2013 to create a business program for students that allowed them to earn their bachelor’s and master’s degrees in four years. The Southwire Sustainable Business Honors Program (SSBHP) is in collaboration with UWG’s Richards College of Business (RCOB). The program helps the students gain practical business knowledge as well as an understanding of how various facets of a business work together to guarantee sustainability and profitability. The four year program was built around Southwire’s five tenets: “building worth, growing green, living well, doing right and giving back.” Southwire initially funded the program by donating $1.1 million to RCOB, making it the largest donation in RCOB history. The cohorts participated in a wide range of projects and community service activities as well as a year-long internship. The first cohort, or group of students to participate in the program, compromised of only six students: Garrett Bishop, Ethan Brown, Jared Ervin, Blair Fox, Jovan Johnson and Taylor McDermott. Bishop, now a junior at UWG, was the only freshman in the first cohort of SSBHP students. Bishop is a double major in management and finance. SSBHP was specifically designed to help students enhance personal, social, ethical and environmental responsibility as well as give them a different learning experience by pairing them with representatives at Southwire. Each year, the students are given a mentor in their area of interest. They receive a new mentor every year, and the cohorts are further broken down into different divisions. Another quality that sets the program apart from others is the cohorts and the friendship they developed over the years. The students are required to be enrolled in honors courses and participate in academic and extracurricular lessons that focus on sustainable business practices. 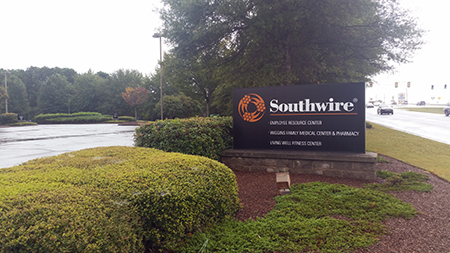 Each year of the program focuses on one of Southwire’s different pillars. During their first year, the students participate in four volunteer events as well as develop and deliver life skills presentations for 12 Life students. They also work during the summer with the Sustainability Community Advisory Panel to foster communication. The cohorts were also required to complete a certain amount of community events their first year. The third year is when the cohorts begin their internship. The two semester long internship is divided between operations and commercial to help develop knowledge of how they work together to make a company successful. For Bishop, the first day of his internship aligned with the first day of fall classes on Aug. 24, 2015. The third cohort of SSBHP student began their journey on Aug. 24, 2015, and a fourth cohort is planned for next year. The students must have high academic requirements not only to join, but also to remain in the program. Students who want to join will be evaluated on high school GPA, SAT or ACT scores and any extracurricular activities that demonstrate leadership and commitment to the community. Once accepted into the program, students must maintain a 3.5 or higher GPA, stay enrolled in honors courses, follow the program’s strict curriculum and complete all required extracurricular activities.